While the definition of a dove wing spur strap can vary, the term traditionally refers to a wide, one-piece spur strap in the shape of a dove's wing. Because they are a single, one-piece strap they don't need buckles to join them together like other types of spur straps that are made of two pieces. They are a favorite with many cowboys and cowgirls. Dove wing spur straps are also sometimes called "bird wing" or "pigeon wing" spur straps. 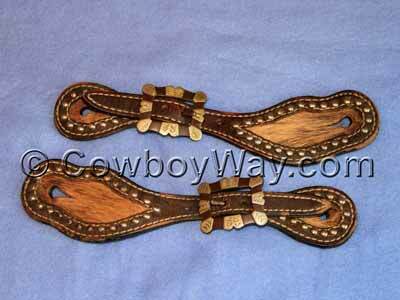 For more information on dove wing spur straps please scroll down beneath the spur straps for sale. Below: A pair of dove wing spur straps. 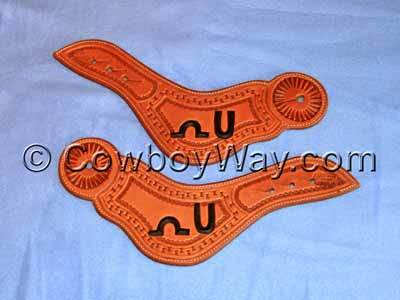 Below are dove wing spur straps for sale on eBay, Etsy, and Amazon. Please note: Occasionally spur straps that aren't dove wings show up in the items below (especially with Amazon). Make sure the spur straps you're looking at are actually dove wings. Like we said above, dove wing spur straps are usually considered to be wide, one-piece spur straps in the shape of a dove's wing that don't have buckles. Since they don't have buckles each dove wing is a single strap, whereas other styles of spur straps are two straps that are joined together by buckles. Below: A pair of dove wing spur straps before being put on a pair of spurs. When worn with spurs on a pair of boots the "Mill Iron U" brand will be across the arch of the foot. 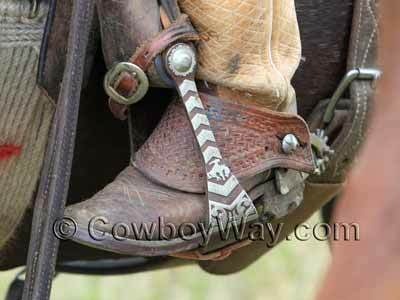 Not everyone uses the term "dove wing" to describe a spur strap in the same way. 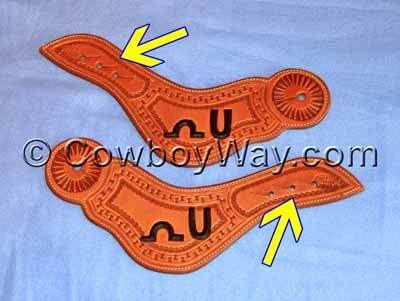 Below is a little more information about dove wing spur straps. While most people describe dove wing spur straps as buckleless, one-piece straps that resemble the shape of a dove's wing, there are exceptions. 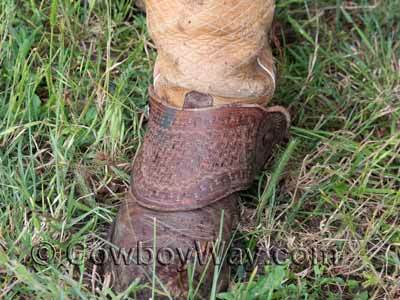 For example, we have seen spur straps that were narrow at one or both ends but flared out over the boot described as dove wings. Some of these styles are even two pieces, not one, and therefore have buckles. While this doesn't fit the traditional definition of a dove wing some sellers still describe these other styles as dove wings. If you're shopping for spur straps read the description carefully and look closely at the photos to determine the style of the strap for yourself. The shape of dove wing spur straps can vary. Some have a significant flare to them that creates the shape of the wing, while others are much sleeker. 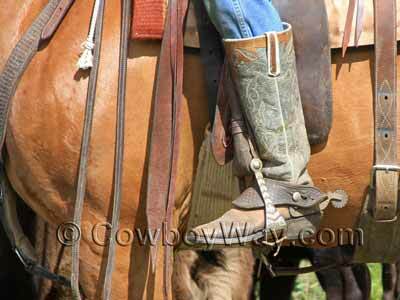 Since dove wing spur straps don't have any buckles, they are put on and taken off by slipping them over the top of the boot. However, just ask any cowboy or cowgirl and they'll tell you that even if spur straps do have buckles they often don't use them......they simply slip the spurs on or off over the top of the boot without bothering to unbuckle them. With spur straps that use buckles, the buckles are used to adjust the fit for the width of the foot. Dove wing spur straps, however, are adjusted by using different spur "button" holes on one end of the strap. Below: The yellow arrows are pointing to holes in one end of dove wing spur straps. 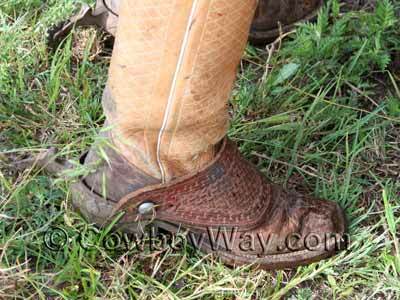 By using different holes when attaching spurs the straps can be adjusted to fit narrower or wider feet. Just because there aren't any buckles on a pair of dove wings doesn't mean they can't have any silver or conchos. Dove wings can be plain or fancy, tooled or untooled, and with or without silver, conchos, or other adornments. Finally, some wide spur straps that resemble dove wings DO have buckles. These are often called a "strap and bib" style. To avoid confusion between styles some sellers might call their dove wing spur straps "old style" or something similar to let you know that their dove wings are the traditional one-piece style without buckles. 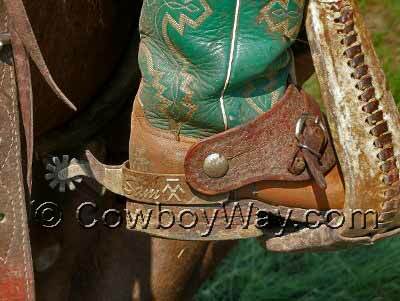 Below: Dove wing spur straps with a basket-stamp design. Below: The same spur straps shown above only this time shown from the front. Below: Dove wings being used by a working cowboy. Below: Spur straps that are not dove wings. Each strap is two separate pieces that join together by buckles. Below: These spur straps are wide across the arch of the foot like most dove wings, but they are two pieces joined together with buckles and therefore are not dove wings.